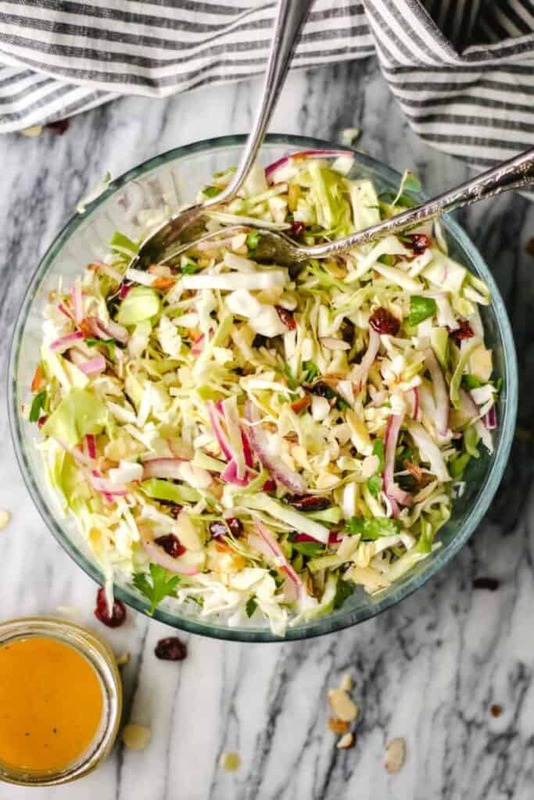 Cranberry Almond Slaw is tossed with an Apple Cider Vinaigrette. It is light, refreshing, and the perfect addition to your Thanksgiving menu! I discovered this Thanksgiving Slaw on The Kitchn a few years ago. I have been making a version of it ever since! 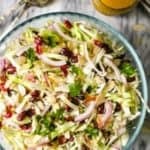 Cranberry Almond Slaw adds crunch, cuts the richness of the other sides, and is satisfyingly light. This slaw is not a creamy, heavy slaw. It is tossed with an Apple Cider Vinaigrette that is just so good! 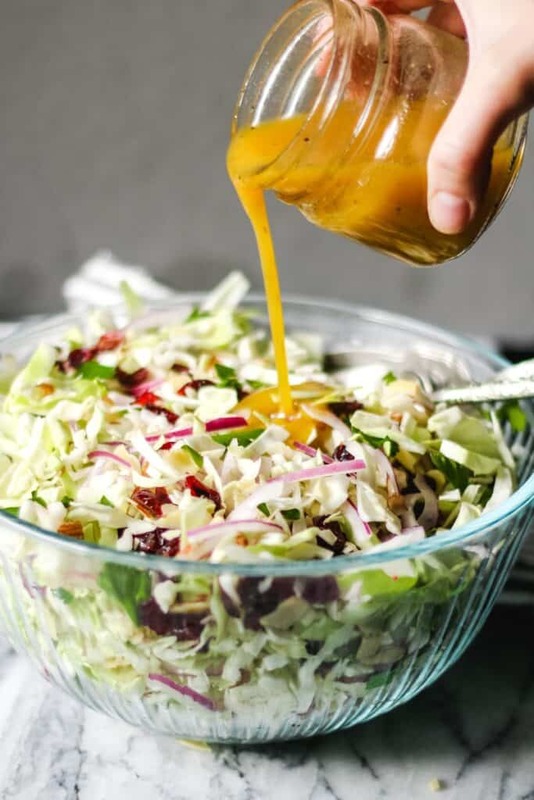 By the way, the vinaigrette would be great on any salad, not just this slaw! 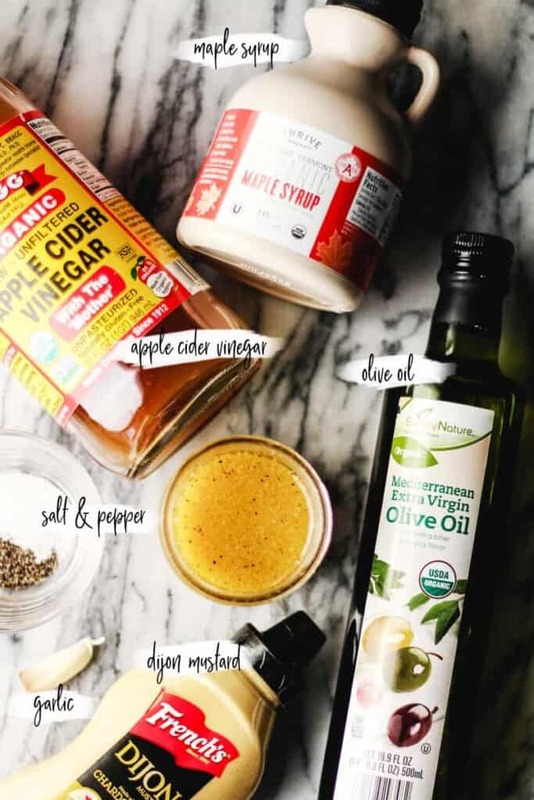 Making the Apple Cider Vinaigrette is so easy… just layer all the ingredients in a small mason jar, screw the lid on tight, and shake it up! So simple, right?! 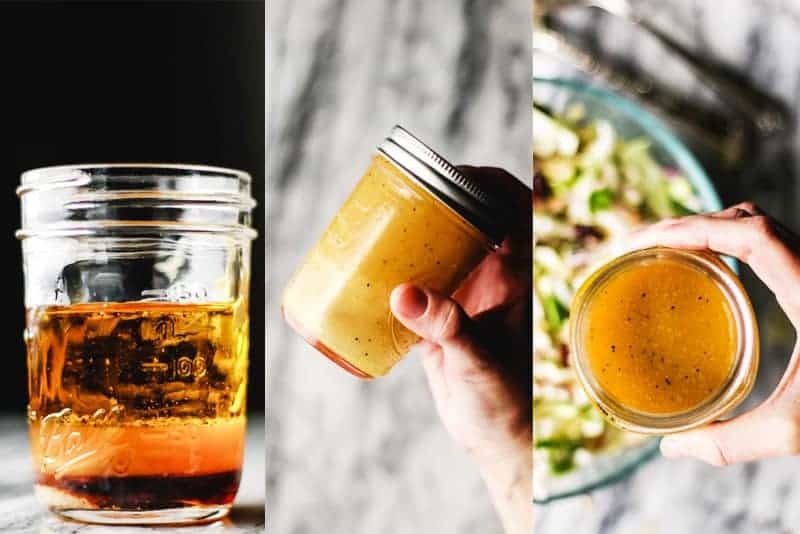 Who knew it was so easy to make a fantastic dressing right at home? After you make the vinaigrette, keep it in the refrigerator. You can make it a day or two in advance of Thanksgiving. Just give it another shake when you’re ready to use it as it will separate. 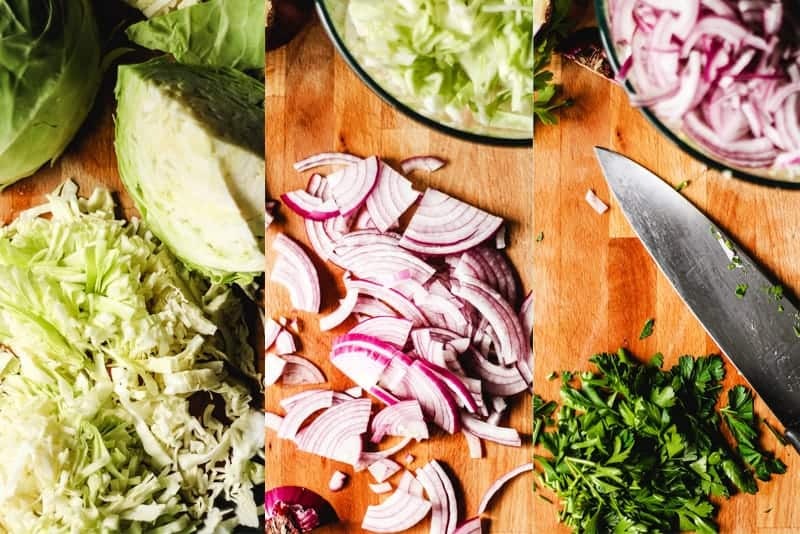 To prep the slaw, thinly slice the cabbage. I only used half of the cabbage for this recipe, which was about 8 cups of shredded cabbage. I prefer to slice my own cabbage as opposed to buying the pre-shredded, bagged stuff. Mostly because it’s cheaper and fresher. Put the sliced cabbage in a large bowl, mine was a 10-cup bowl and held everything perfectly. Then slice the red onion and chop the parsley. 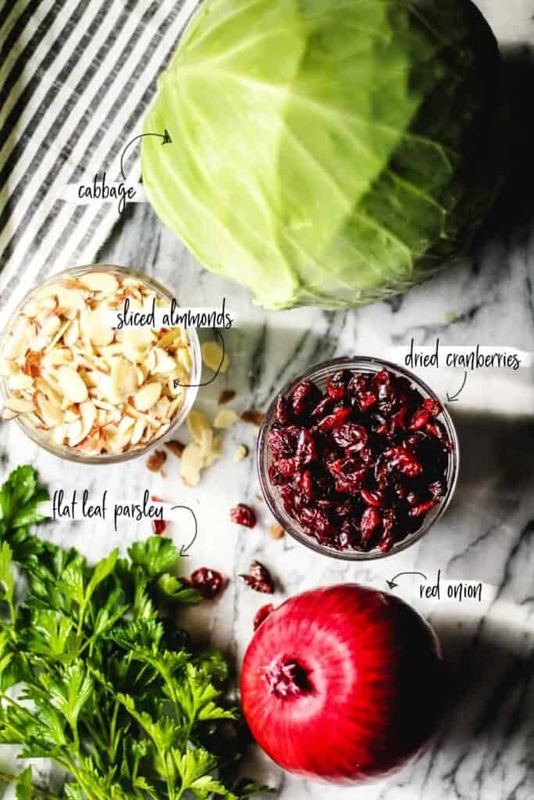 Layer the red onion, parsley, cranberries, and almonds on top of the cabbage in a large bowl. Cover and refrigerate until serving. This can be done about 1 day in advance. 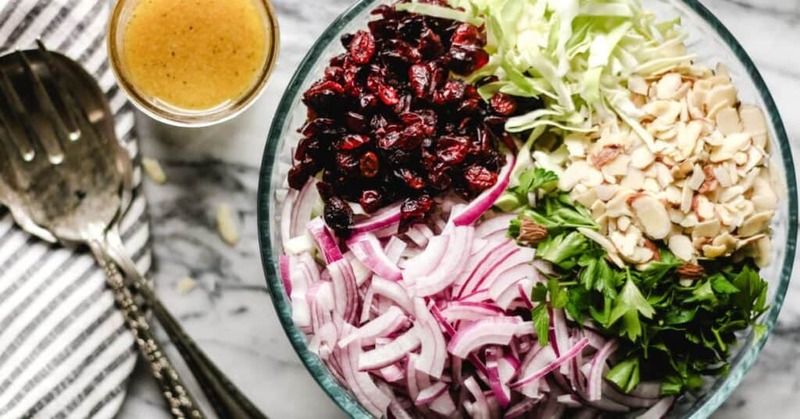 When it’s time to serve the Cranberry Almond Slaw, all you need to do is take the bowl out of the fridge and toss the cabbage, red onion, cranberries, and almonds together. Then pour the Apple Cider Vinaigrette over the top and toss again. You can use as much or little of the Apple Cider Vinaigrette as you like! Serve immediately or refrigerate up to 1 hour. I prefer to serve it fresh to ensure everything is still really crunchy. This slaw can sit out for a while, without concern for bacterial growth, since the dressing is not mayonnaise-based. The leftovers will keep well, refrigerated, for about one day! 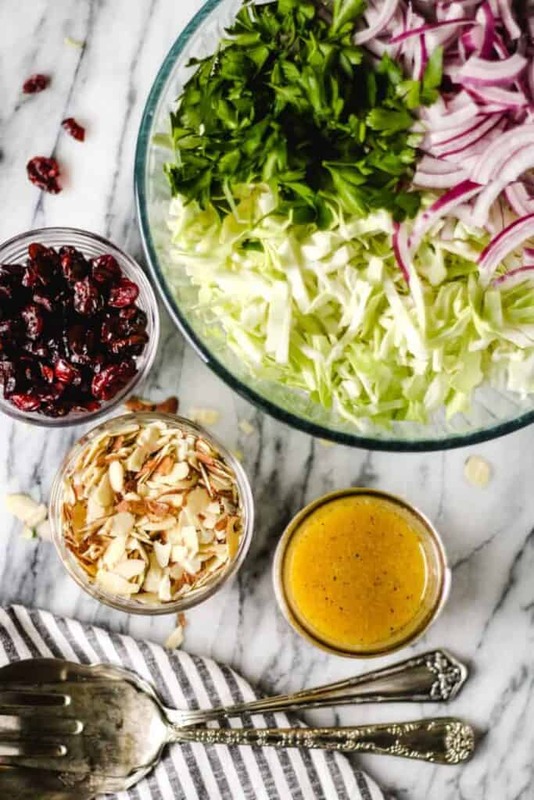 Cranberry Almond Slaw with Apple Cider Vinaigrette is light, refreshing, and the perfect addition to your Thanksgiving Menu! Layer the vinaigrette ingredients in a small mason jar. Screw the lid on tight. Shake, shake, shake. Refrigerate until serving. Can make 1-2 days in advance. Cut the half cabbage into 4 equal wedges. Remove the core and thinly slice the cabbage. Thinly slice the red onion. Chop the parsley. Layer the red onion, parsley, cranberries, and almonds on top of the cabbage in a large bowl. Cover and refrigerate until serving. Can make this up to 1 day in advance. Toss the cabbage, red onion, cranberries, and almonds together until combined. Shake the vinaigrette and pour over the slaw. Toss to combine. Serve immediately or refrigerate up to 1 hour. The slaw will be fine sitting out on a buffet for several hours. Refrigerate leftovers for up to 1 day. We love this slaw. It’s become a favorite veggie on Thanksgiving. Light. Crispy. And good for you too.